The switch on the bridge and the left hand switch on the lower level are the culprits.. Since the push buttons work, your assumption is correct. Definitely a wiring disconnect under the layout. Your only option is to run a new wire to the non derail rail. Keep us posted. Also check your rail gap for that feature. Rails could move through expansion and may be touching. Your picture does not show the complete, two (2), input rail sections, that trigger the non-derail function. 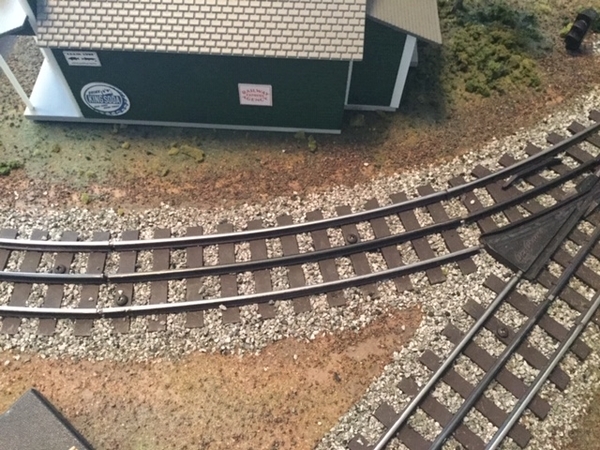 Either one of those two rail pieces could be touching the adjacent outside rail, or as been mentioned a wire disconnected is most likely the problem. A test would be: jumper from one outside rail, to the trigger section, with a short jumper, (which is the same as what the axle of an engine or car does). IMO Mike CT. It's been my experience with this problem that invariably the cause is in the common side of the wiring. Good luck ;these glitches can drive you bonkers. The input gaps for both switches are clear. Note bridge closeup and the two input tracks to the ground level switch. I was hoping that it was a gap problem as that would have been an easier fix. My intuition is that it is either a disconnect wire or a common or (phasing) problem since I recently disconnected and rearranged my power station since my TIU was away receiving an upgrade. I am using a separate transformer to power these two switches and may need to reverse my wires to insure common ground to the outer rail (I did do that but did not fix the problem). I am leaning to a disconnect problem with the leads connected to the isolated input tracks. Trains have no problem passing through the switches and the manual buttons work just fine. They also have no problem traveling over the isolated section power so the ground connect must be compatible with 18 volts from my Z4000. Tom, you are correct about the frustration I am experiencing! All is well in River City!! I‘m a little embarrassed to report this but since I am a happy camper I’m making this post. Hopefully it might serve as a lesson to some other novice along the way. First of all, I really appreciate the input form all of you and I thank you for taking the time to offer your insight and suggestions. Let me start with the fact that I had unhooked all electrical power to the layout in January because I sent my TIU in for a system upgrade. I had long planned to reorganize my power station and this was the opportunity to do so. I have several transformers supplying power to my layout, MTH Z-4000, Lionel V-150 & 1033 plus several plug in DC power adapters for LED lighting, Tortoise switch machines and track signals. My short term memory failed to remember that the DZ1000 switch machines were getting power from the fixed 14v terminal of the Z-4000 which provided a common ground and center rail power. I had rearranged the placement of my transformers when I re-powered. After spending time checking & rechecking all my wires and terminals connections to the DZ1000s, the light bulb in my head went on and I realized why the switches worked only with the selector buttons but not with the isolated contact. I was using the wrong transformer and the isolated section was not receiving power! Now the selector buttons use the fixed power source of the Z-4k to activate the switch and the non-derailing rails uses track power supplied by the Z-4K to activate the switch and both use the transformers common ground. Once this was understood and corrected, everything works perfect! Love it when a problem finds a solution!!!!!! Sometimes it helps to just sit back, relax and think about it. By the way, your layout looks terrific. Glad you figured it out! I just wanted to chime in to say how much I like the 'camouflaging' of the switch machine on the bridge. It blends in perfectly! Nicely done layout!